CLEVELAND, Ohio — Browns owners Jimmy and Dee Haslam and GM John Dorsey met with coach Hue Jackson on Monday morning and fired him, a league source told cleveland.com. 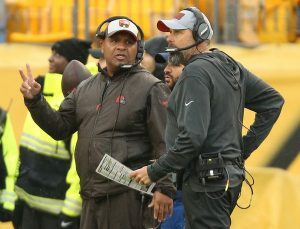 A short while later, they also fired offensive coordinator Todd Haley, a league source told cleveland.com. The two men were involved in a power struggle over the under-performing offense, which Haley had full rein over this season, and both lost their jobs. DC Williams was named Interim Head Coach and RB Coach Freddie Kitchens was promoted to OC.